Like its cousins, the Eagle and the Hawk, the Falcon is revered as a noble creature. It is a formidable hunter and a symbol of Hope and Opportunity But where and when did our love affair with the Fearless Falcon begin? The Falcon is a bird of prey with exceptional talents, intellect, and hunting prowess. The Peregrine Falcon strikes terror in the hearts of many and has become a military icon for many countries around the world. Peregrines are renowned for their intellect and their ability to accurately judge the distance between prey and hunter in order to make sweeping dives for the kill. It is not uncommon for hunters to have a trained peregrine by their side during difficult expeditions. Ever wondered why George Lucas (of Star Wars fame) named the flagship of his rebel group the Millennium Falcon? Falcons represent Freedom and Hope in many cultures across the globe. As such, George Lucas may have been inspired to pay homage to this bird's history by bestowing that name to Hans Solo's grand ship. Falcons are emblems of the Sun. In ancient Egypt, the all-powerful Sun god, Ra, was often depicted with a falcon on his headdress as a symbol of his power and intellect. These animals are renowned for their ability to remain focused on a particular prey for an extended period of time and have come to symbolize determination, discipline, and commitment to one's duty. 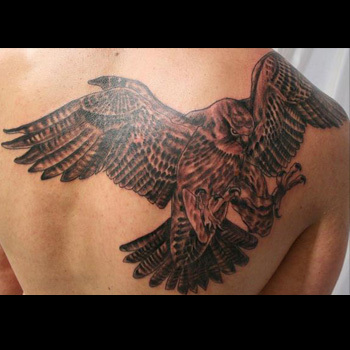 Falcon Tattoos are drenched in power, strength, and a strict sense of duty and discipline. No wonder they are popular icons for military themed designs across the globe. Most artists play up the bird's formidable reputation by showing these magnificent animals in a powerful pose. Sometimes, the falcon is in full flight and in other instances, it is shown in a perched position with its head turned to stare down unworthy onlookers. To really display the true beauty of a Falcon Tattoo, it is best to stick with a body part that allows for motion; thighs and biceps are great spots because they not only provide a large surface area, but movement of the underlying muscles offer depth and dimension to your design. Falcons are forces of power and strength, as such, tattoos that feature these magnificent birds must also ooze the same memorable traits. It can be a tricky undertaking to craft a design and add elements that will stand out. There are many factors to juggle, including the purpose and placement of your new artwork. Mistakes are costly, so it pays to spend some time getting the design details right. For inspiration and guidance, take advantage of our Custom Design Service, where our team of artists can put their expertise in the field to your advantage.